The 1966 class of Fifth Formers. ST Joseph’s Secondary School, Miri, reached a historical milestone on Dec 10, 2016, when 27 former classmates got together to celebrate the 50th anniversary of their fifth form class. And that day did arrive —- with the help of the Internet, WhatsApp, telephone calls and Facebook. Many of the alumni travelled to Miri for their “golden reunion” from the US, the UK, Australia, New Zealand, Peninsular Malaysia and different parts of Sarawak. Their “homecoming” get-together (to renew bonds of friendship and reminisce about the good old school days) spanned four days in Miri and Kuching. “We were thrilled to meet each other after 50 years. We assembled in the Keogan Hall at our school and had a session in the same Form 5 classroom. Believe you me, the old classroom is still there — with the same windows and walls – to recollect sweet memories. We called each other by our nicknames — one of us even acted as a particular teacher and taught like him. Everyone laughed until tears rolled down their cheeks,” revealed Chih Ching Chuang of the ’66 class of Fifth Formers. He remembers they were taught by mostly expatriate teachers such as Mr and Mrs Gomez, Mr Philip, Mr and Mrs Varghese, Father Slowey, Father Keogan, Father Dekker and Father Brentjens. The old boys and girls were impressed by the development and expansion of the school over the past five decades Their love for the school found expression in a generous donation for the school magazine and the 85th Anniversary Commemorative Book. The group had also a memorable luncheon at Tim’s Seaside Hideaway. Nicholas Yii, a former student and former principal, told thesundaypost he was with the school from primary to secondary levels and had the honour to serve as principal. Tan Kim Weng, the ever cheerful and helpful Miri town boy whose father worked for the Miri Theatre, said light-heartedly, “It must have been my connection with the theatre that made me very popular,” adding that he was glad to be back to meet old classmates “and I can still tease them like I used to in the 60’s”. He travelled all the way from the United Kingdom for this class of ’66 reunion. Doreen Yu enrolled at St Joseph’s Primary School when fate brought her Hong Kong-born father to Miri to work as a supervisor of schools. It was hard for her at first as she had so little English background. But with the help of good teachers, she adjusted, felt accepted and soon mastered the English language. In 1966, she topped her class in the Senior Cambridge exam. Doreen remembers the new St Joseph’s Secondary School in 1963 and the good times she had cycling to school with friends. Their science teacher was Mrs Gomez – and she still remembers a replica skeleton hanging on a pole in the science lab. She also has very fond memories of fishermen hauling in their catch at Brighton Beach near her house. She was even given fish to bring home. These touching moments make Miri special in her life. “This reunion is special for me because I have not seen most of my classmates since 1966. And I would like to tell all our teachers they did a really great job, giving us a wonderful and wholesome education. Our Form 5 results of 100 per cent passes were actually beyond our own expectations,” she told thesundaypost. Doreen brought to the reunion her 1966 autograph book with all the special messages from her classmates. Her thoughtfulness helped to melt the years away. Alumni signing the school’s Visitors’ Book. Chih Ching Chuang, the Marudi boy who now lives in Melbourne, has a Foochow name with three “C” initials. So his schoolmates called him C Cube for short. As he recalled, he and four other boys from Marudi had to literally put body, mind and soul together to pursue education in Miri. Born in Poyut, Baram, Ching Chuang grew up during the Japanese occupation and his childhood years were harsh. He only started school at the age of eight and had to walk to the Hua Nam Chinese Primary School in Poyut. 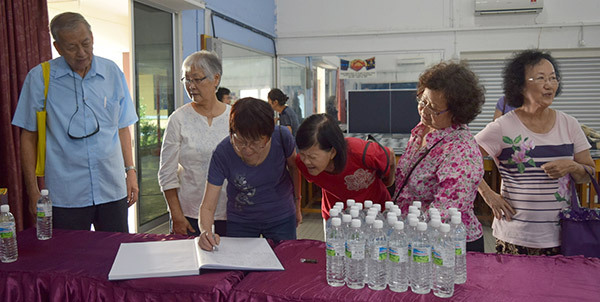 After Primary 3, his family moved to Marudi town where he attended the English session at Good Shepherd’s Primary School in the morning and the Chinese session at Sungai Jaong Chinese Primary School in the afternoon. After Primary 6, he and three other pupils — Louis Huong, Peter Huong and Joseph Hii – were recommended by the head to continue their studies at St Joseph’s Secondary School in Miri. The four Marudi boys lived in one room in Miri town, shared their cooking and did all the chores themselves. One of the things he remembers most vividly during his time at St Joseph’s was his first blood donation at Miri Hospital. C Cube said his education at St Joseph’s had inculcated in him – for that matter, in all the students — a strong sense of self-discipline, good hard working ethics and a positive attitude. These attributes, he pointed out, had enabled him to go for tertiary education in Perth, Australia from 1969 to 1972. Today, this old Josephian from Marudi is enjoying a dream job as a golf coaching pro based in Melbourne. And as he said, he is still doing a lot of walking. Fahmi Omar, born and raised in Kampung Dagang, Miri, was the eldest in a family seven siblings. His father wanted to educate him in English and enrolled him at St Joseph’s Primary School. He went on to complete Form Five and later taught at Miri Secondary School before leaving for Kuala Lumpur in August 1967 to study statistics at Mara Institute of Technology, now UiTM. In 1971, he decided to stay on in KL so that his siblings could join him and continue their studies there. He was with Survey Research Malaysia (now AC Nielsen) for eight years, then joined the Information Ministry where he worked until his retirement in 2004. Fahmi, a proud father of five, said like many others, he had lost touch with all his classmates after they left school. Sixty years ago, a parish priest was responsible for getting as many girls as possible to school. Back then, many parents were reluctant to send their daughters to English schools. One of the girls, Irene Yong from Kuching, who got to study in an English school, reminisced about how she was put at St Joseph’s Primary School at a young age by Father Horsbosh. “He came to our Pujut house in his black Morris Minor to talk to my mum. He was so keen to have me in the school that he even came and drove me to school — I don’t know for how long. Pujut was then very far from Miri. The reunion enabled the alumni of St Joseph’s Secondary School, Miri, to get together after 50 years. As students, they witnessed the history of the town (now city) unfold — how people struggled for a living and how the Roman Catholic Church set up a mission to bring education and social change to the community. C Cube summed it all up, “The 1966 SJS class of Fifth Formers have come a long way from their humble beginnings in 1966 after the Senior Cambridge Exam. In the years that followed, we were like passengers in a train, getting off at different stations to fulfill our missions in life. It is learnt the 85th Anniversary of St Joseph’s Schools will be held on October 28, 2017 in Miri under the patronage of the Head of State, who is a former Josephian. Contact Jolene Phang for tickets.